How to look good naked. Tricky. Unless of course you are a cake in the hands of Brisbane food stylist and entertaining guru, Lyndel Miller; then you are going to look pretty sweet in the buff indeed. 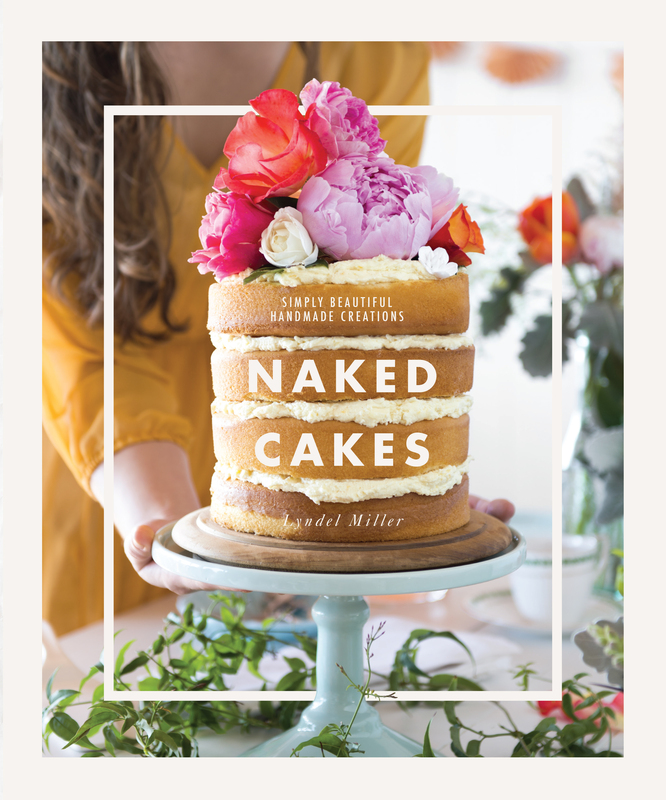 We catch up with the baking talent to discuss her new book, Naked Cakes. What’s one cake every baker should master? Start simple. Learn how to make a butter or pound cake from scratch. These cakes require techniques like creaming and incorporating wet ingredients with dry ingredients, patience and mindfulness—simple, valuable, yet understated skills. Top 5 tips for making a cake look good naked? 1.Make sure you split and level all your cakes to the same height. Consistency is the key to good looks. 3. Use buttercreams at room temperature. 4. Crown your cakes just before serving! Melting buttercream and wilted flowers will never be a good look. 5. Present you cake on a beautiful plate or pedestal! It deserves it. Always make your cake with love, it shows. I love you: Favourite flavour again. It's about them entirely. Oops, sorry, I did it again…: Anything decadent, rich, gooey and sinful that transports the recipient to another place so they fall in love with you all over again. Got to be some chocolate in there, I'd say. What alternative flours do you find best to cook with? I find premade gluten free flours best. Buy these flours from stores that turn them over readily. Fresh ingredients are important. Spelt flour is also great for substituting white flour one-for-one without altering the consistency and end result too much. The most nerve-wracking cake making experience you’ve ever had? Cooking in a foreign domestic oven! The oven had no indicators/settings as they had worn off. I had no idea how it was going to perform. 3 tools that will most help the home baker? A good spatula. I like spatulas with flexibility. Stainless steel mixing bowls for hand mixing! This way you are less likely to have a 'did I put that in?' moment. If you could make a cake for any 3 people (alive or dead) who would they be? My Nannas. I sadly never got to make either of them a cake whilst they were alive. And anyone that has never had a birthday cake made for them. Sadly they are out there…A birthday cake is special, everyone should have the pleasure of receiving one. Prepare the honey buttercream (see below). Prepare the lemon curd (see below). Prepare two coconut cakes (see below). While the cakes are cooling, prepare the limoncello glaze (see below). Pour the limoncello glaze evenly over the top of the cooled cakes and allow to stand until set. To assemble, place one of the cakes on a cake stand or serving plate. Using a clean, damp spatula, spread half the honey buttercream over the top of the cake. Place the second cake on top and spread the remaining buttercream over the top of the second cake. Use some of the buttercream oozing out of the layers to thinly ‘whitewash’ the sides. Just before serving, spoon the lemon curd over the top of the cake, allowing some to drizzle down the side. Cover the lemon curd with coconut flakes, piling them a little higher in the centre and allowing them to spill slightly over the side of the cake, into the drizzling lemon curd. Pile several large rose petals in the centre of the cake. Place the willow twigs on top of the petals and tuck some underneath. Finally, place the elderflower blossoms in and around the rose petals. Honey flavours can vary immensely, and some change with age, so experiment and see which type works best for you. Personally, I just love the flavour of untreated honey. Using an electric mixer, beat all the ingredients together for 3–5 minutes or until light and fluffy. Use it to fill or top the cake of your choice. Note: Honey will vary in sweetness, so add it to taste. If you need to add more sweetness, then add a little extra icing sugar as required. This brings back such fond memories of times in the kitchen with my grandmother. Place all the ingredients in a heatproof bowl over a saucepan of just simmering water, making sure the base of the bowl doesn’t touch the water. Whisk continuously for 15 minutes or until the mixture thickens enough to coat the back of a wooden spoon. Remove from the heat, cool slightly, then pour into sterilised jars, or cool and serve on a cake. Keeps in the refrigerator for up to 2 weeks. The coconut flavour of this lovely moist cake is setting trends and pleasing crowds everywhere. It’s a wonderful choice for summer events, and pairs effortlessly with fresh fruit – especially tropical fruit. Preheat the oven to 170°C (325°F). Lightly grease a 20 cm (8 inch) round cake tin. Sift the flour, baking powder and salt into a bowl and use a hand-held whisk to combine well. Using a fork, lightly beat the egg whites and the egg in a bowl, then add the coconut cream, vanilla and coconut extract and whisk until well combined. Using an electric mixer, beat the butter and sugar until light and fluffy. With the mixer on low speed, gradually add the flour mixture and the egg mixture alternately and beat until well combined. Spoon the batter into the prepared tin and smooth the top. Bake for 20–30 minutes or until a skewer inserted into the centre of the cake comes out clean. Let the cake stand in the tin for 10 minutes, then turn out and transfer to a wire rack to cool completely. Notes: If using stevia, make sure you use a brand that substitutes the sugar with an equal amount of stevia. Some brands use a considerably smaller quantity of stevia and this will adversely affect the batter, so make sure you check the packet. If you prefer, you can make two thinner cakes by dividing the batter between two 20 cm (8 inch) cake tins and reducing the cooking time to 15–20 minutes. Limoncello is an Italian liqueur made from fermented lemons, which I am quite partial to – especially the organic variety! You can substitute Mandarinello, made from mandarins, or Arancello, made from oranges. Recipe and image from Naked Cakes by Lyndel Miller (Murdoch Books) $49.99 available now.